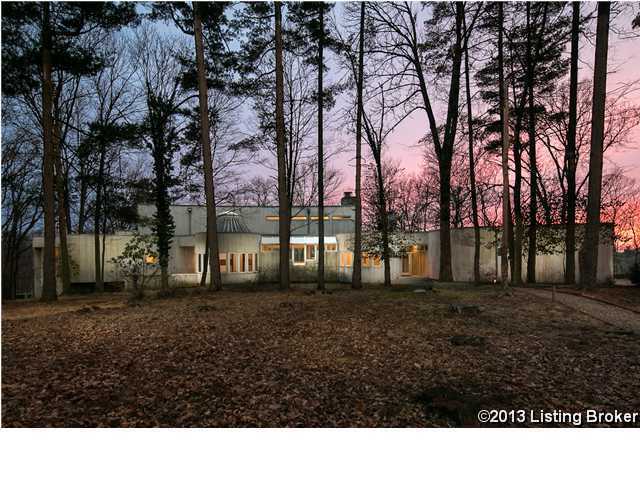 Exciting Contemporary on 4 1/3 verdant acres in Covered Bridge Crossings - the site of the old Boy Scout Camps. This home received the merit award for excellence in Architectural Design from the Kentucky chapter of the American Institute of Architects. Wonderful views from decks, balconies and every window! Quality materials throughout including vertical western red cedar exterior and lead coated copper flashing & down spouts. Dramatic great room with 30 foot ceilings, curved stacked-stone fireplace, stunning circular dining room with 18 foot domed ceiling, library/family room overlooks great room, gourmet kitchen with professional top-of-the-line appliances including Thermador, Traulsen and Gaggenau. First floor master with his and hers dressing rooms and baths. Direction: US Hwy 42 to Covered Bridge to Covered Bridge Crossings Subd, take Eagle Way to St.
, Prospect KY 40059 is a Home, with 3 bedrooms which is recently sold, it has 4,800 sqft, 0 sized lot, and 3 Car Garage,Attached,Entry Side parking. A comparable Home, has 5 bedrooms and 4.5 baths, it was built in and is located at 8200 Wolf Pen Branch Rd Prospect KY 40059 and for sale by its owner at $ 1,150,000. This home is located in the city of Prospect , in zip code 40059, this Jefferson County Home, it is in the NONE Subdivision, and GLEN OAKS are nearby neighborhoods.